2 flute, carbide tipped with totally enclosed ball bearing guides. For use in trimming laminates and pattern routing. Go to Flush Trimming V-Notch bits. 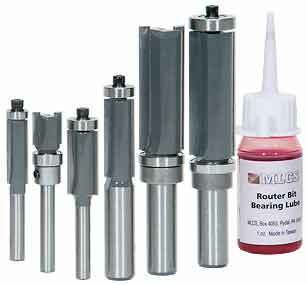 I ordered the 1/4" diameter by 1" cutting length flush cut bit and when I used it the first time the bearing broke. I got a quick replacement from MLCS, but the replacement seems to have a rough rolling bearing which is not smooth at all. I've noticed with both bits that the bearing is too narrow and gouges the pattern as the bearing rolls along. They really need to put a taller bearing on this bit or put two bearings on it. Even being really careful, this bearing tends to gouge the pattern or surface that it touches. I don't have this problem with other bits. 2 flute, carbide tipped with totally enclosed ball bearing guides. 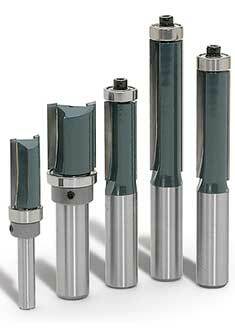 The shear angle cutting flutes produces a smoother cut than the traditional straight fluted bits. 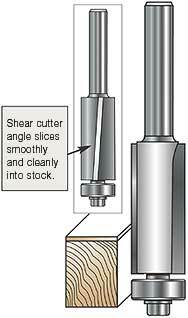 Instead of chopping at the wood fibers at a 90º angle, the shear angle design allows for a smoother shear angle, slicing cut. 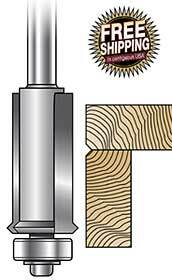 Use this bit to eliminate tear-out problems from routing end or cross grain on very hard woods. I love this bit. It shears through the work piece rather than chops. This bit leaves a nice, clean edge on veneered plywood. No splitters. Difficult cuts, like going over knots, is not a problem. An excellent value. 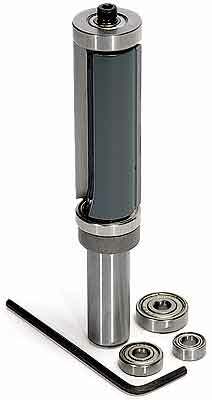 Eagle, please add a 2" cut length model and add a removable top bearing. Thanks. Top notch bit for jointing edges and for final shaving of that last smoothing 1/32" from the edge. Great bit. I have used this about 5 times so far and the cut is good and noticed that the bearing has some play in it so the bearing will need to be replaced soon. I use this to cut acrylic and the things I make are for sale and are expensive so I will not be using this bit any more for finishing, but maybe for initial trimming before glue up, maybe. Have used this bit often when template routing and always get clean edges with no chips or tear-out. Can't ask for more than this! 2 flute, carbide tipped with totally enclosed ball bearing guides. The top mounted bearing is ideal for template routing. In addition to template routing these bits are convenient for flush trimming in many applications where a bottom mounted bearing is not practical. I have been looking for a 1/2" x 1/2" pattern bit for awhile to use on my guitar work. This bit saves me a ton of work, and performs exactly like it should. Get two bits in one. 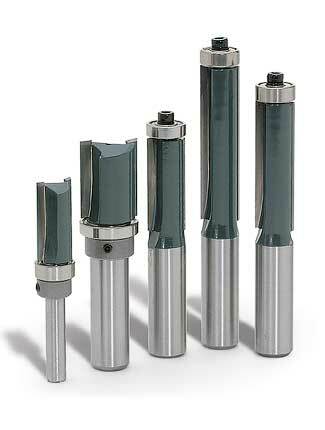 With MLCS Top & Bottom Mounted Bearing Flush Trim/Pattern Bits, you have the option of mounting your template above or below your workpiece. 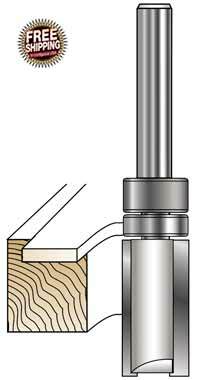 You can trim laminate on either side of your substrate without having to change router bits or turning over your workpiece. Just adjust your router bit height before making your second pass. All bits are 2 flute, carbide tipped with 2 totally enclosed ball bearing guides. Recently I had the chance to purchase one of these bits for working with templates, is just amazing the time I saved since I don`t have to change bits anymore, just adjusting the bit height I can always run the stock along the grain, which is a way safer and results much smoother. If you do some template work this is the right bit to go. I have made 8 arched windows for my old watermill during the barn restoration and I used 3/8th MDF templates and got perfect results. Now my barnwindows are better then most people have for the home they live in. I am an Airline pilot and not a professional woodworker and nobody thought I could do it .... they apologized, and I am darn proud of those windows. There are not enough Stars (max 5) here to really rate this design ..... TOP. 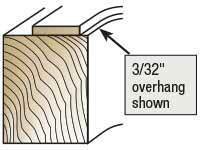 Remove precise amounts of material from the edge of doors or very large panels, or whenever size makes it difficult to use a router table. By varying the bottom bearing diameter, you can accurately remove 1/16", 1/8" or 3/16" in two passes. Kits are available for stock up to 1-3/8" thick, or 2" thick. Kit includes 3/4" Top & Bottom Bearing Flush Trim/Pattern Bits with two 3/4" OD bearings, three additional bearings (5/8", 1/2", and 3/8" OD), and a hex key. (When using the bit, for the first pass adjust the bottom bearing to run at the bottom of your stock, removing the designated amount from the top of the stock. For the second pass, readjust the bit height to allow the top bearing to run along the previously cut top of your stock, completing the trimming operation). Used for the first time! Great job sharp and accurate!! Works well for trimming things like doors. It should be done prior to mortising latch bolt. I would recommend it to others. 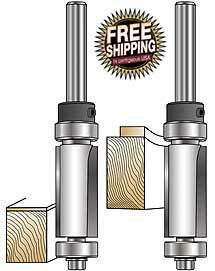 Includes four 1/2" and one 1/4" shank router bits. Includes Pattern/Flush Trim bits #6506 and #8808, Flush Trim bits #7804, #7805, and #7807. Save $29 off regular price! 2 flute, carbide tipped with totally enclosed ball bearing guides. For use in trimming laminates. Makes a "V" where the two pieces join together, effectively hiding a less than perfect joint. Ideal for cabinets and drawers. Go to Flush Trimming bits. I have used this bit to form a decorative touch to clocks and boxes, hide seams. It's awesome. Definitely worth the money. I even bought it as a gift to a fellow woodworker.